Deer Creek is the most southwest area in Littleton being located between Conifer and Rodborough on the outskirts of the Rocky Mountain foothills. Deer Creek spans several miles with homes tucked between the rolling hills and many off the beaten path. Most of the homes in Deer Creek are ranch and two-story but they vary from 1,300 – 5,700 square feet floorplans with about half having a walk-out basements due to the terrain. Homes in the area have been built since the 1920’s and construction still slowly continues today. You will find some equestrian friendly properties with lot sizes ranging from 1-40 acres. Garage types vary greatly with some having 2-3 car attached while others have 1-2 car detached garages and some only have off street parking. Young children will be bussed to West Jefferson Elementary & Middle school, while teenagers will attend Conifer High School. Homes for sale in Deer Creek Canyon will put you close to nature, give you a peaceful environment, and sought after privacy. See what your home is worth With an Instant Home Valuation Online. Want advice on selling your house? We provide a free staging consultation, pre-listing prep plan, and a Deer Creek real estate market analysis. Call us at 303-325-5690 to learn more. New to the Area? 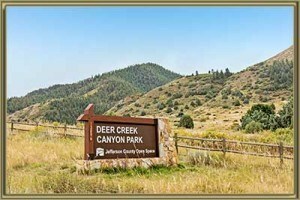 Call our Deer Creek real estate agent at 303-325-5690 to schedule your tour of Homes in Littleton CO.